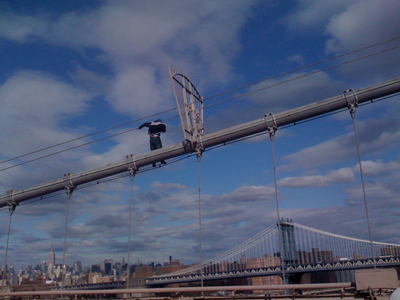 While I biked over the Brooklyn Bridge this afternoon, I spotted a police helicopter with open doors. 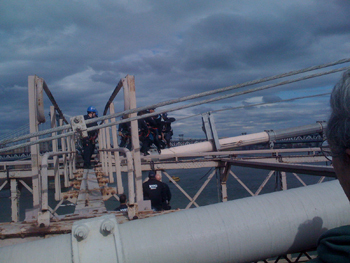 As I got closer to the middle of the bridge, there was a young man standing on the suspension cables. 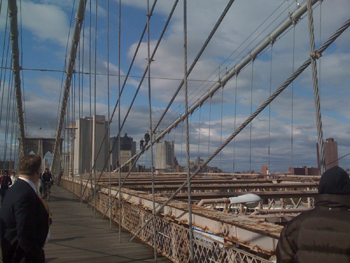 He was wearing blue jeans, a hat with stripes, and he faced the East River, holding a cable with his two bare hands. He seemed to be talking into headphones that were tangling from his right ear. Obviously, he was a jumper. 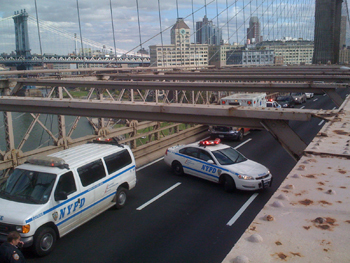 Dozens of NYPD cars and a couple of ambulances blocked traffic on the Brooklyn Bridge. 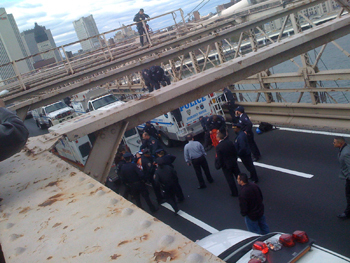 Two NYPD officers started to approach the man who was trying to commit suicide. They slowly walked up the cables, constantly talking to him. 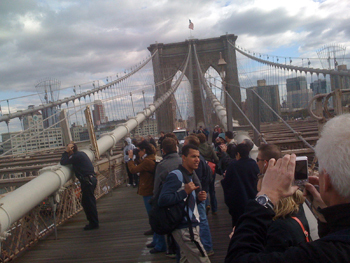 People on the bridge started to take photographs. Some stopped and screamed, “don’t let got”, “come back”, “stay alive”. As the police came closer, the jumper moved back and told them to go away. He even leaned forward, starring down. Stoically, the policemen moved further up. At around 2.23 pm this afternoon, one officer grabbed his hands. He then secured him with hooks and robes. 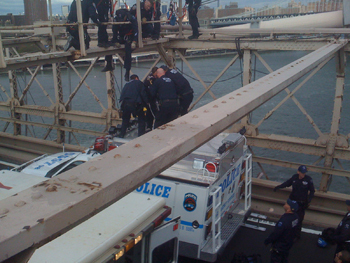 People on the bridge cheered. 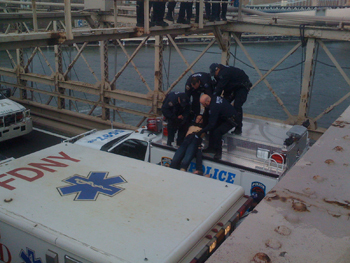 Shortly after the police got him, the jumper fainted. This made it very hard to move him off the cables. 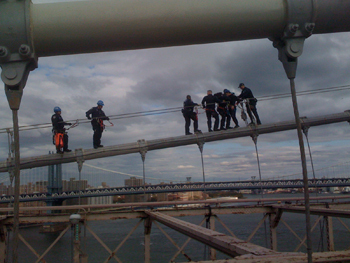 It took six rather strong looking NYPD officers some time to bring him down. As they came closer to the little bridge that leads to the suspension cables, one could hear a policeman talking in Spanish to the man. He called him “Fabio” and tried to motivate him to keep going. But “Fabio” – I’m not sure whether Fabio is really his name – seemed unconscious as they lowered him on the roof of a police car. From there they loaded him onto a stretcher, and then into an ambulance. 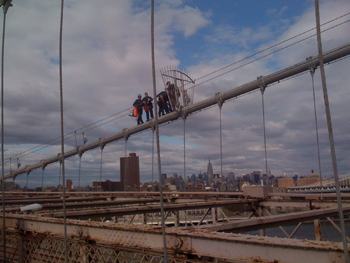 The Brooklyn Bridge rescue succeeded. Around 2.51 pm, “Fabio” was driven away to live another day. Well done, NYPD.